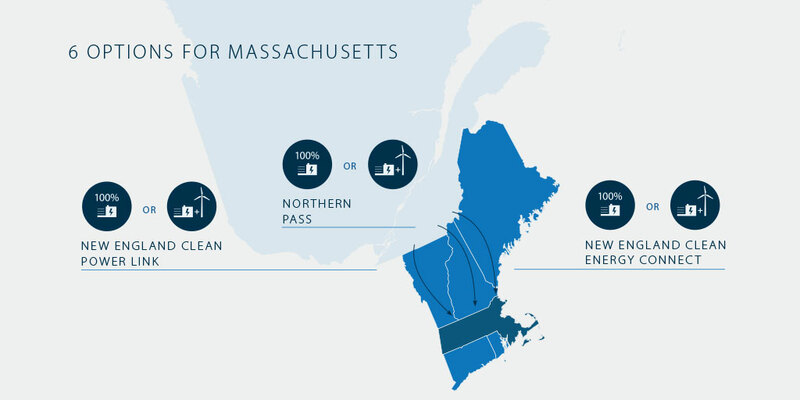 To meet Massachusetts’ energy needs, Hydro-Québec is proposing six options —either 100% hydropower or a hydro-wind supply blend — offered over one of three proposed new transmission lines. Through innovative partnerships with proven leaders in New England’s energy sector and experienced Québec wind power producers, this new supply of clean energy would be provided to Massachusetts in the form of firm deliveries, every hour of the year for the next 20 years. The attributes of Québec hydropower as a low-carbon, flexible baseload electricity source are well suited to contribute to all of Massachusetts’ objectives. What’s more, Hydro-Québec’s high-performance fleet of existing hydropower generating stations produce energy that is available today, in significant quantities. The hydro-wind supply option has been designed with Gaz Métro, a leading energy provider in Québec and New England, and Boralex, a large and experienced private renewable energy power producer that has carved out a major share of the wind power market in Canada. The proposed project, SBx, is a 300-MW wind farm, which would be the fourth phase of the Seigneurie de Beaupré Wind Farms. WBx would be entirely developed, financed, built and operated by Boralex and Gaz Métro. On March 31, 2017, Massachusetts’ electric distribution companies launched a Request for Proposals for the procurement of large quantities of firm clean energy which will help the state reduce its energy costs, enhance reliability and contribute to its greenhouse gas reduction requirements. The RFP’s objectives were laid out in Massachusetts’ law, An Act Relative to Energy Diversity, in August 2016. The law also lays a foundation for the New England region to transition to a cost-effective clean energy future. The Act requires utilities to competitively solicit proposals for 9.45 TWh of clean energy generation from diverse sources, including firm hydropower and onshore wind supported by hydropower. "Massachusetts is leading the way in New England's energy transition," said Éric Martel, Hydro-Québec's CEO. "Our hydropower can be the foundation to reduce the overall price of electricity for the people of Massachusetts and help the state integrate more renewable sources onto its grid."